If you close your eyes and think about the word Mediterranean, what comes to mind? Beautiful sea vistas, right? That must have been what Italian builder Benetti and exterior stylist Giorgio Maria Cassetta thought when creating the Mediterraneo 116, their semi-custom yacht built in fibreglass and carbon composite. Oli, delivered last summer, is the first. She arrived in the US, her full-time home, after cruising some favourite Mediterranean spots last summer. The owner, who’s enjoyed a series of boats, starting with a Sea Ray, has plans to cruise in the Caribbean with his young family, who all enjoy being outdoors. “I wanted to enjoy large external areas and light-filled interiors, with a seamless connection between outdoor and indoor,” says the owner, who has taken a big step up in size from his previous yacht. 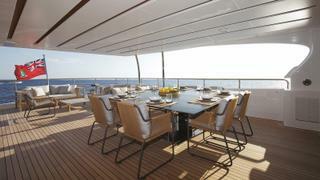 He liked the preliminary plans for the Mediterraneo, which, he says, provided the perfect starting point for Oli. 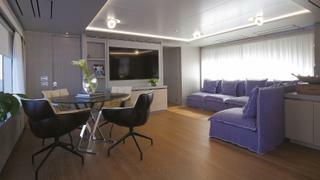 A few modifications from the “standard” layout include a superyacht spa pool with jets (bigger than specified) for the spacious recreation area forward of the pilothouse, an original modular seating group adjacent to the pool, and a helm station on the large sundeck (which comes in addition to the two wing stations). Compact and complete, it sits on the port side, a useful navigation aid to negotiate South Florida’s busy inner waterways and their “weekend warriors,” as Oli’s captain calls them. 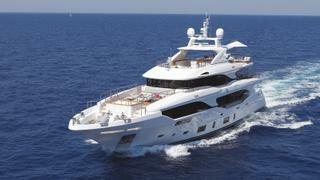 Benetti yachts in this range have a strong identity, and coming up with new lines is not easy. The builder wanted to get a more modern feel but keep a strong link to the Benetti family, says Tommaso Bilotta, the brand manager for Benetti Americas. 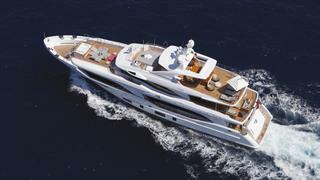 Cassetta may have stayed under the radar so far but he is not new to the yacht design world. He always loved boats and as a child he drew them constantly, he recalls now. After graduating from a university yacht design program in Rome, Cassetta worked with Zuccon International Project and Andrea Vallicelli, whose firm designed most of the vessels built by the ISA shipyard in Ancona. Cassetta had already decided to set up a design studio in northern Europe after working with Vallicelli on the yacht that became Okto, when he received a phone call from the office of Azimut-Benetti’s chairman. 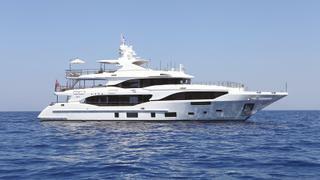 A few months later, he began collaborating with the Italian builder, first on the Mediterraneo and then on a new-look Delfino, which has grown to 28.95 metres LOA. He is also involved in a number of custom projects, many of them confidential. Likening the methodical evolution of the Benetti displacement Class line with the careful steps Mercedes took with designer Bruno Sacco in the 1980s, Cassetta began adding details that moved the needle forward a bit without cutting all ties with the past. “The exterior spaces have been sculpted with a succession of concave and convex shapes, and the boat has a lot of muscularity,” he says. A stand-out feature is the wide opening semi-circular glass door between the main salon on the main deck and the outdoor lounge aft. It opens up the view effectively, especially in conjunction with the large windows framing the salon/dining area. 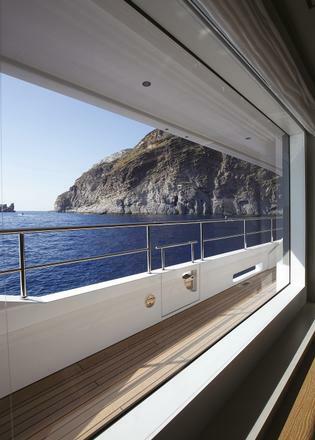 To achieve this glass wraparound feature, Benetti had to move the air trunks from the engine ventilation system. 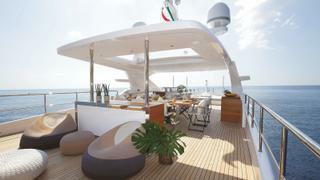 Cassetta suggested they could be concealed behind the fashion plates flanking Oli’s aft deck. 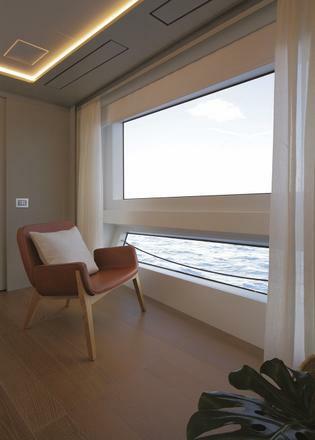 Big windows, comprising two horizontal panels, are also an important feature in the master stateroom, located forward on the main deck, a beautiful space a couple of steps up from a cosy superyacht office. Space-saving pocket doors ensure the bedroom’s privacy. 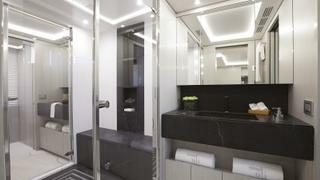 Forward are two bathrooms on each side of a good size, glass-enclosed shower attractively finished with lightly veined white Statuary and black Marquina marble. Oli has a crew of seven, including the captain, who enjoys a private cabin adjacent to the minimalist bridge in front of a vertical windshield. 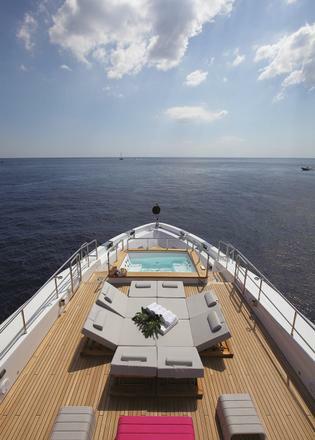 One of the noteworthy achievements on this yacht is how the yard and designer managed to create dedicated access points for crew and guests — as would exist on a larger yacht — on a relatively small platform. A lot of care went into building a large amount of storage and accessibility. 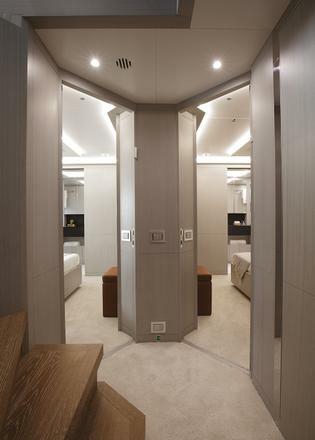 Oli’s crew have three double-bunk cabins on the lower deck, each with its own en suite, and a small mess, accessed directly from a modern and bright galley. 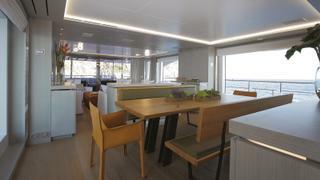 Another set of crew stairs leads directly to a small pantry serving the skylounge and the spacious dining area on the bridge deck. On hull No 2, the owner has opted to have a superyacht elevator and do away with this set of stairs and the standard dumb waiter. Guests have their own set of stairs to access the four cabins on the lower deck, distributed around a small foyer. Each of the cabins has a private en suite with single vanity and a large shower. 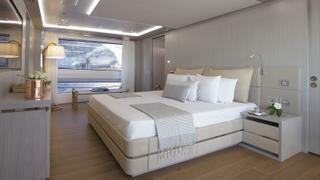 Two of the cabins feature large beds oriented away from the large porthole, and two have twin beds plus a Pullman bed. The décor on Oli is, according to the client’s wishes, on the modern, easy-going and lighter side; combining brushed oak flooring with grey wood veneer from Tabu. It’s meant to be practical and easy to maintain for an owner with a young family and, accordingly, all sofas and chairs have easy to wash slipcovers. A playful beachscape by photographer Gray Malin adds colour to the dining room. The emphasis is on outdoor living, with two large exterior dining areas and bar on the bridge deck and the superyacht sundeck that spans 80 square metres. Up there, away from prying eyes, is a sunny area to set up lounge chairs, a great bar with stools and a large table under the hardtop with an integrated sliding shade. The designer and yard opted to forego built-in furniture to afford each owner the freedom to arrange the vast exterior deck spaces to their liking. No recreational space is lost to the Williams jet tender, which is accommodated snugly in a garage along with a PWC. 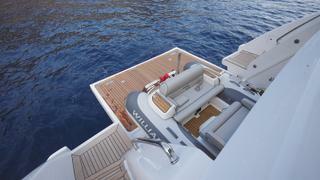 It launches with ease on rollers through the transom door and over the swim platform. With naval architecture by Pierluigi Ausonio and Azimut-Benetti, two 1,400hp 12V MAN engines and five-blade props, this full displacement yacht with bulbous bow reaches a top speed of 15 knots. Oli runs efficiently at 12 knots and at ten knots has a range of around 3,000 nautical miles. 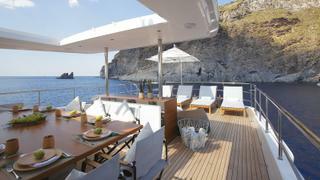 For comfort and ease of manoeuvring, Benetti opted for quiet electric stabilisers and bow thruster, all by CMC. Thus far Benetti has sold three Mediterraneos, all to clients in the Americas, and each with different custom features and interior designs. They are also available with interior designs by Achille Salvagni, who developed two schemes — one modern, the other more traditional and inspired by the interior of ocean liners — complete with bespoke furniture. Options abound, including building it to comply with LY3.